While the Frenchman hunted for running gear at our favourite sports/camping shop, I went next door to check out an unfamiliar supermarket. And that's how I found the 2kg (4.4lb) box of litchis for R29 ($2.90) at Fruit and Veg City/Food Lover's Market on the Main Road in Tokai. When I compared the almost-empty Woolworths box of litchis we had at home, that was 1kg, and R65.00. I am litchi-deprived. I find them only in Chinatown in New York, and then they cost a lot more. They are a common summer fruit in these parts, and are grown in the sub tropical provinces of South Africa. Good ones are plump, with crisp, brown-pink shells. Their flavour is pure tropics. I shelled half of these ones for a fruit salad last night, with slices of the small sweet pineapples that are so ripe they are almost orange. We ate them while listening to owls calling to each other in the greenbelt. Yum! I'm not sure that I've ever tasted a litchi. I've seen lychee nuts but never this fruit. 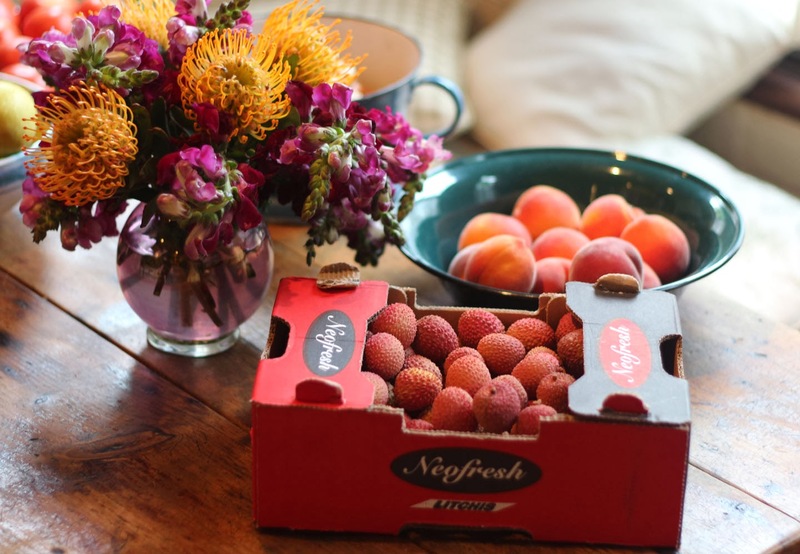 Litchis are also known as lychees or lychee nuts. Are the standard pesticide/spraying agricultural practices pretty well regulated in South Africa? No idea what the standard practises are if not labelled organic. I worry more about soft fruit like strawberries that absorb sprays. I absolutely adore lychees. A few years ago I was travelling in Honduras and came across a guy who had a truck stacked with them. I paid him about the equivalent of 50 cents to fill a supermarket bag - and feasted for the rest of the day. Amazing! Love them, however they are spelled (here, it's lychee). At present, they are still expensive, but the price should drop as more hit the shops. There is sometimes a man-with-a-pick-up, selling farm grown fruits and I'll buy his if I see him. I have four seedling (from spat-out pits) coming along nicely.